One of the students participated in a video-teleconference with geology-geophysics professor Brian Popp, who is living in the Aquarius Undersea Laboratory about four miles off the Florida coast. The screen on the left is the view outside the habitat and the computer screen on the right is Popp. Isle youngsters had plenty of questions for a University of Hawaii scientist who took them on a virtual tour of his current laboratory 45 feet beneath the sea off Florida's coast. But there was no doubt about their collective opinion. "That's so cool!" 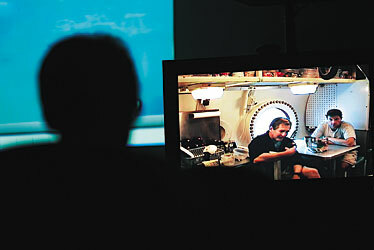 a student exclaimed when scientist Brian Popp appeared on the video in the Aquarius, the world's only underwater habitat. "Cool" was a word heard often at the University of Hawaii at Manoa during the live video-teleconference Friday from the undersea laboratory/home in the Florida Keys National Marine Sanctuary. The conference was an unusual addition to the ninth biennial open house of the School of Ocean, Earth Science and Technology this weekend. 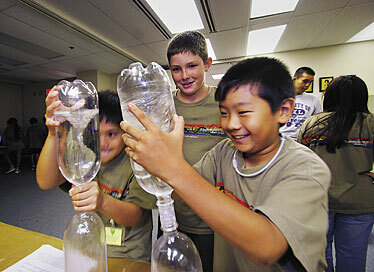 Noelani Elementary School students Nate Ng, Bowen Anderson and Jake Kawasaki had fun Friday at the "Tornado in a Bottle" exhibit during the School of Ocean, Earth Sciences and Technology open house. "Ocean Depths to Outer Space" was the theme of this year's event, with activities spread in and around the Hawaii Institute of Geophysics, Marine Science and Pacific Ocean Science and Technology buildings. "Science Under the Sea" featuring Popp was held Friday morning in a teleconference room on the eighth floor of the POST building. The geology-geophysics professor and five other scientists and technicians entered the Aquarius on Oct. 14 for 10 days of research on marine sponges. The habitat is operated about four miles off the Florida coast by the National Oceanic and Atmospheric Administration's Undersea Research Center. "It looks like a big tube," noted Jennifer Engels, a UH assistant geology professor, who coordinated the teleconference. Popp walked his distant viewers through the facility, explaining that it is 43 feet long and 20 feet wide, with six bunks (three high), a shower and a toilet and a small kitchen with a microwave, a trash compactor and a refrigerator (with a lot of cheese). Divers with cameras showed the yellow habitat from outside and the underwater scene, displayed on a large screen. "What you see over there is the reef in the Florida Keys," Popp said. Excited kids marveled as they watched scores of fish swimming around the habitat. "If we're really lucky we will see a really big grouper about 200 pounds that's been hanging around the habitat," Popp said. He showed how scuba divers enter and leave the vehicle via a "wet porch." After 24 hours under water, he said, the divers have a buildup of nitrogen in their blood so they can work on the reef long hours without getting bends. Technicians monitor the life-support systems, scrape growth from the habitat and keep it safe and running, Popp said. "We've got to monitor all the gases in here all the time." The scientists want to know how important sponges are in coral reef ecosystems because they pump tremendous volumes of water, making waste products like fertilizer, he explained. "How many gallons does a sponge pump in one day?" asked a student. About a half-million liters (1,345,000 gallons), Popp answered. Among other questions, the kids wanted to know what the aquanauts eat, whether their ears pop and what are the strangest things they've seen underwater. They add water to dehydrated food and fresh fruit is sent down to them, Popp said. "It's fine for 10 days and there is a lot of sashimi outside." "I'm kidding," he quickly added, explaining that fishing isn't allowed in a marine sanctuary. He said their ears pop a lot, especially when there are a lot of waves, which changes the pressure. They can't go to the surface until the end of the 10 days when the habitat is brought to surface pressure over 17 hours so the aquanauts can decompress, he said. Then they slowly swim to the surface. Marisa Payne, 8, told Popp that her father, Jim Payne, a Navy SEAL diver, was in the Aquarius and had a cold. He was in the habitat earlier this year for training, explained Marisa's mother, Sheri, of Halsey Terrace. "I would not like to have a cold here," Popp said. The air is much thicker and it's hard to talk sometimes, he said. "I can't whistle because the air is so thick." A Navy doctor makes scuba house calls to the Aquarius every other day, Popp said. He said the aquanauts have seen some strange fish. It's hard to get to sleep at night sometimes because of the view out the window, he said. As it gets dark, fish are attracted by the habitat's lights, he said. "It's unbelievable. It's like looking at an aquarium all night long."